You can add a song to a presentation and play it across slides in the background of your slide show. If you want to use music from the web, you have to download it to your computer before you can use it in a presentation. On the Insert tab, select Audio, and then Audio on My PC. In the file explorer, locate the music file you want to use and then select Insert. With the audio icon selected on the slide, on the Playback tab, select Play in Background. Play in Background makes the audio file start automatically during a slide show and also makes the audio play across multiple slides. If your slide show is longer than one song, you can add more songs. However, if you find that you're having trouble synchronizing the music with the slide show, you can use a third-party audio editing tool, such as Audacity®, to string the songs together into one file so they play continuously throughout the slide show. On the Insert tab, select Audio, and then Audio from File. With the audio icon selected on the slide, on the Playback tab, click the list named Start, and select Play across slides. See Add or delete audio in your PowerPoint presentation. See Video: Add multiple songs to your presentation. 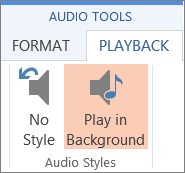 In PowerPoint Online, you can't add sound to a presentation, but you can play sound that has been added to it. If you want be able to add sound to slides in PowerPoint Online, please go to our suggestion box and vote for it.